High sensitivity provided by laser based forward light scatter for reliable early warning. Unique ClassiFire-3D® Perceptive Artificial Intelligence System. Laser Dust Discrimination (LDD) with a patented dust management and separator system. 4 sampling pipes up to 250m maximum total length. RS485 communications built in as standard for networking and remote communications. LPCB approved sampling fo up to 100 sampling holes. Senator 200 is a highly sophisticated 'next generation' of High Sensitivity Aspirating Smoke Detection product that has been designed to ensure that installation and commissioning is as simple as possible, while optimizing performance. Senator 200 has unmatched sensitivity potential, providing the earliest warning of incipient fire with mimimum rate of nuisance alarms. ClassiFire-3D® is the most comprehensive intelligence found in a smoke detection system to date and ensures that the detector operates at optimum sensitivity for the protected environment, without the need for complex setup. Senator 200 can be provided as a standard detector or as a detector c/w command module, the command module provides central monitoring and display of detectors on a SenseNET network. Volt-free Fire and Fault relay outputs are available for remote monitoring by local fire detection or BMS systems. Senator 200 is also provided with 3 pairs of remote control input terminals which can be configured for a number of functions. 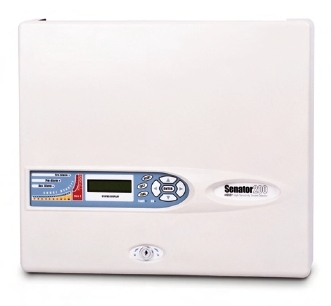 Senator 200 can be programmed through the front panel, via a command module or PC. Addressable Protocol Interface Cards APIC™ available for most popular industry signalling protocols. Command Module available for central monitoring and display. SenseNet compatible - up to 127 detectors per loop. Lower cost mimimum display option is available.